Last month a car crashed into the Hornet Restaurant for the third time that year. Photo: The Hornet. The BMW that slammed into the Hornet restaurant over the weekend marks the third driver who crashed into the restaurant this year, the latest evidence that Denver’s high-speed streets destroy property and threaten public health. However, on Valentine’s Day, a driver injured a pedestrian outside the restaurant, which was the second time a car barreled into the restaurant this year. Workman says that the problem affects the entire neighborhood. Compared to when the restaurant opened, foot traffic has multiplied in recent years as other restaurants and bars have opened. As walking on Broadway has become more common, he has personally witnessed cars hit and injure other pedestrians nearby. Heavy concrete trash cans, planters and bollards outside of the Hornet failed to prevent this year’s crashes. Photo: Andy Bosselman, Streetsblog. “Denver has a public health epidemic, right now, with speeding and irresponsible driving,” says Piep van Heuven, Policy Director of Bicycle Colorado. “We can tell these stories on every major arterial in and around Denver.” She cited Broadway, Federal Blvd, Colfax Ave. and Hampden Ave. among the city’s most dangerous roads. Last week, Denverite reported that 59 people have died walking, biking and driving on Denver streets so far this year, more than in all of 2017. The growing number of fatalities counters the city’s own goal for safe streets. A 2015 rendering of what a two-way parking-protected bike lane might look like on lower Broadway. Image: City and County of Denver. But both Locantore and van Heuven are hopeful that changes planned for Broadway will make the corridor safer for pedestrians and cyclists (and restaurant patrons). 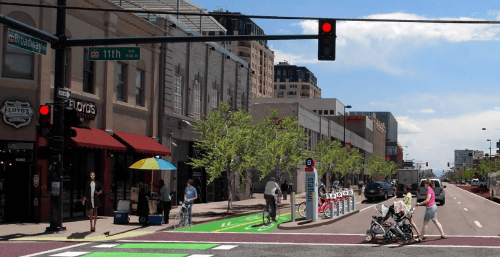 A plan that features street design upgrades, called Denver Moves Broadway, will add a bikeway separated from road traffic and other features to protect pedestrians. Narrowed streets and improved traffic signals will also encourage drivers to travel at safer speeds. The city is designing the project now with construction expected to start in 2020. Denver voters funded the project when they approved the 10-year, $937-million “Elevate Denver GO Bond” in the fall of 2017. The latest crash at the Hornet happened at 2:15 a.m. on Saturday morning when a car slammed into the restaurant so fast that a 750-pound trash can on the sidewalk did little to impede the vehicle before it plowed past the building’s wooden frame and windows. Inside, the car barreled through the dining room before it finally stopped when it slammed into an interior wall. An instant before the crash, an employee dashed out of the car’s path, a move that saved his life. This year’s string of incidents is not the restaurant’s first clash with a car. 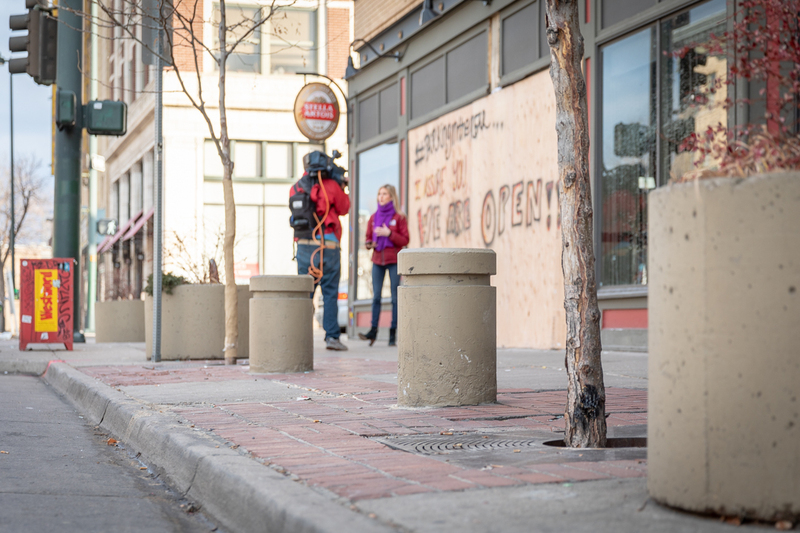 Shortly before the Hornet opened 23 years ago, a driver slammed into its storefront, which prompted Workman to request the heavy concrete trash can, planters and bollards outside of the restaurant today—all of which have failed to prevent this year’s crashes. Tuesday is Colorado Gives Day. Support Streetsblog with a tax-deductible donation today. Click here. It would appear you must be getting ‘settled’. Why wasn’t the broadway bike lane shovel ready the day the bond was approved? They’ve been planning that thing for years. I heard they ran out of shovels…. Without citing the reasons why this happened, it’s hard to justify anything. Don’t imply high speeds unless that was actually the case. And after the bus lane was put in, speeds have reduced overall but probably not at 2am. I would also like more details about this, maybe the person just thought they were hitting the brake pedal which would cause them to accelerate even more and/or they were drunk, design won’t help a situations like that very much. DENVER (CBS4) – A driver is being investigated for DUI after crashing into a Denver restaurant. Police say Miguel Ramirez-Martinez slammed his BMW into The Hornet early Saturday morning. Arrest documents state Ramirez-Martinez had slurred speech, watery eyes and his breath smelled like alcohol. God, you can’t solve the problems that drunk drivers cause. Even drunk people respond to the environment they are in. When a street is 5 lanes wide all people feel comfortable driving faster, drunk people especially. When a street is narrow all people will feel less comfortable driving fast, even drunk people. They may still be reckless, but going slower when they do crash. Why do you think things like this continually happen in the same places? The street design matters. And since I don’t see any sign that the state is going to get stricter about what idiots we hand out licenses to, street design is our best tool to lessen and prevent death and destruction by dumb asses in cars. Street design can also prioritize other modes of travel and help make walking and transit more convenient than driving, giving drunk idiots a much safer way to get home. As long as we prioritize driving above all else, the dumbest and drunkest people will still drive because we made it the only convenient way to get around. This is the core of a Vision Zero plan, people will make mistakes, it’s up to those who design the system to make sure those mistakes don’t result in death. This means you don’t just blame a crash on one dumb guy driving, the engineers that built the street have to take responsibility. Knocking over a 750 pound concrete anything and then going through two walls and a window requires considerable energy that has to come from somewhere. Either thousands of horsepower or considerable velocity, and given the car in the picture only has about 200 HP it seems more likely that the energy came from the Vee Squared portion of the kinetic energy equation 1/2mv2. For what it’s worth, the car in the photo has 300hp and can be made to have close to 500hp fairly easily. I don’t think the vehicle did anything but tip the trashcan over, or move it a bit. I realize it has been removed from the site (see pic above) but I can’t come up with a scenario wherein the vehicle plowed directly into, or over, the trashcan. Those paths would not have been possible given that the other items on the sidewalk are still intact. Wood and glass don’t have a chance against a 2-ton vehicle. Yes. In my assessment (armchair QB’ing here, based on the evidence in the photo and google maps), the vehicle drove south down the sidewalk and turned left (east) into the building. Based on the location of the vehicle in the restaurant (not very far in), I would guess not more than 30mph. The BMW that slammed into the Hornet restaurant over the weekend marks the third crash into the restaurant this year—and highlights "a public health epidemic" on Denver's streets.